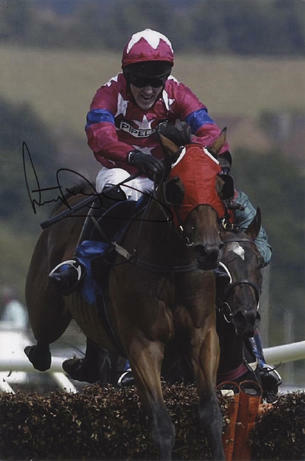 This is an In Person Signed Colour 12" x 8" Photo of the retired Northern Irish jockey. Anthony Peter McCoy OBE (born 4 May 1974), commonly known as AP McCoy or Tony McCoy, is an Irish former horse racing jockey, based in the UK and Ireland. He was named BBC Sports Personality of the Year in 2010, becoming the first jockey to win the award. In December 2013, he was named RTÉ Sports Person of the Year. McCoy recorded his first winner in 1992 at age 17. On 7 November 2013 McCoy rode his 4,000th winner, riding Mountain Tunes to victory at Towcester. McCoy has been Champion Jockey every year he has been professional. Even in his first season riding in Britain, as an apprentice for now deceased trainer Toby Balding, McCoy won the Conditional Jump Jockeys Title with a record 74 winners for a conditional jockey. McCoy claimed his first Champion Jockey title in 1995/6 and, as of 2013/14, has won 19 consecutive Champion Jockey titles, beating the previous record of 7 consecutive titles set by Peter Scudamore. McCoy has won almost every big race there is to win. His most high profile winners include the prestigious Cheltenham Gold Cup, Champion Hurdle, Queen Mother Champion Chase, King George VI Chase and the 2010 Grand National, riding Don't Push It.